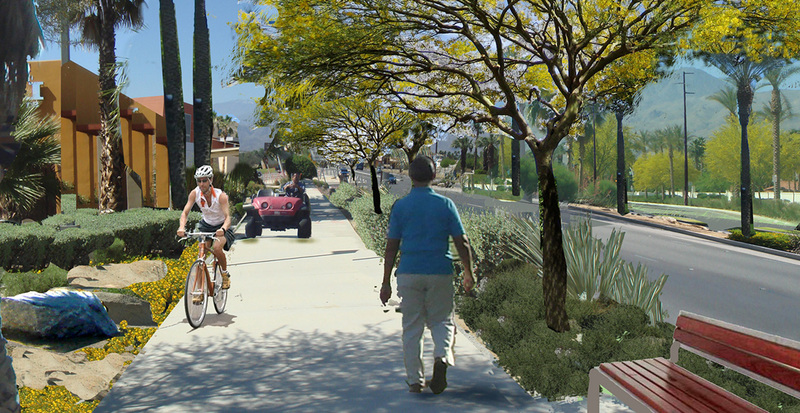 Gruen Associates managed a multi-disciplinary team in incorporating Compass Blueprint’s principles to create a strategy for the City of Cathedral City to connect multiple specific plans, mixed land uses, vacant property, underutilized properties and transportation corridors with key north and south destinations in the city. Gruen Associates completed the existing conditions, issues, opportunities and constraints report for the Corridor, which included analyzing 21 existing specific plans along with other plans applicable to the Project Area. The Corridor Connector Plan involved conducting stakeholder interviews; and preparing alternative development scenarios for the public and private sectors and a final report, which was presented at a Community Workshop, to the City’s Planning Commission and City Council. Gruen was awarded the 2011 Comprehensive Planning Award, Small Jurisdiction from the Inland Empire Section of the American Planning Association for the project.